Here’s our edit of the most exciting new crime and thriller book releases to look forward to this year. 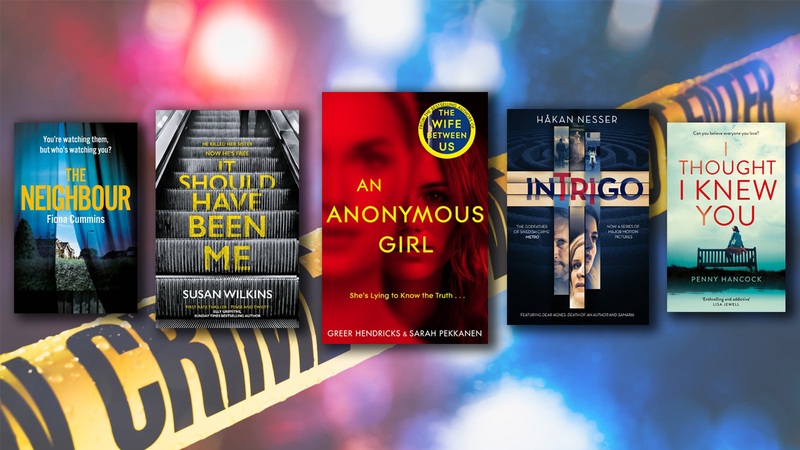 From edge-of-your-seat psychological thrillers to gripping period crime novels, there’s a wealth of exciting new crime and thriller books to look forward to this year. Here, we’ve curated our edit of the best thrillers and crime novels that will keep you turning the pages in 2019. The Lockwoods have just moved into their brand new home, ready for a fresh start. But the other residents on The Avenue hold some dark secrets, there’s even a killer among them. DC Wildeve Stanton has been investigating the killer for six months when the next victim makes things personal. Will she stop the murders before someone else falls prey? June, 1781. A body hangs upon a hook at a London dock - the victim of torture and branded with a slaver's mark. Captain Harry Corsham quickly finds himself embroiled in this mystery, plunged into an investigation full of secrets and the looming threat of mortal danger. When Jessica Farris signs up for a psychology study with the mysterious Dr Shields, she thinks all she’ll have to do is answer a few questions, collect her money and leave. But things quickly get out of hand and Jessica finds herself caught in Dr Shield’s manipulative experiments, no longer able to trust what is real in her life. Roy Grace is back in this new thriller from best-selling author Peter James. Across the globe people are being tricked by the same internet scam - the person they met online, who they loved dearly, does not exist. But this scam comes with a deadly price for anyone who tries to expose it. Intrigo is an incredible collection of remarkable Scandi-noir short stories from the esteemed Hakan Nesser. Each of the five stories in this book are full of dark secrets, compromising lies, and mysterious pasts just waiting to be discovered. Ruby Darke returns in this brand new gangland thriller from best-selling author, Jessie Keane. Having fought her way to the top of the retail industry, not always on the right side of the law, it seems that Ruby can finally relax with her daughter and son by her side. But it doesn’t take long for enemies old and new to start circling . . .
DC Jo Boden was eleven years old when her sister was brutally murdered by her boyfriend. Now, sixteen years later, he is being released, with a documentary being made to prove his innocence. Jo grew up believing her sister was perfect, but what if she wasn’t? This psychological thriller is perfect for fans of Clare Mackintosh and Lisa Jewell. A woman on her way from home from work is held up at gunpoint, chloroformed and kidnapped, but released just hours later unharmed and with all her possessions. A spate of these seemingly harmless kidnappings leaves Inspector Montalbano baffled but determined to get to the bottom of this mystery. Frank Peter’s life is complicated and it only gets more so when he discovers a frightened young woman hiding on his property in the middle of winter. He takes her in and learns her tragic story, having been trafficked by those who had promised her the world. But it’s not long before the men that brought her here start looking for her and Frank has no idea what they’re capable of . . .
Sean and his tracker dog Benny work in Africa preventing poaching and protecting precious wildlife. So when a colleague is almost killed by a planted bomb explosion, he is horrified and determined to get to the bottom of it. Can Sean find the bombmaker and keep his personal life together at the same time? Ray Celestin is back with the third instalment of his neo-noir City Blues Quartet crime series. Private Investigator Ida Davis is called to New York to investigate the murders of four people. But it soon becomes clear that there is a greater conspiracy behind these deaths and it will take Ida right into the dark heart of New York. Jules and Holly are best friends and have been there for each other through the best times, and the worst. But, when Jules’ daughter accuses Holly’s son of a terrible crime, their friendship is turned upside down. Will it ever be the same again? And what will be the consequences of the devastating accusation? Tom Marcus served as a Surveillance Officer in MI5 for over a decade, dedicating years of his life to protecting his country from harm. In I Spy, he shares his story of a life lived in the shadows and the person he became in order to stay alive. Barry Sutton is on a quest for the truth. Across the country people are waking up with memories of a life they have not lived. Are they victims of a mysterious, new disease affecting memory? Or is something terrible happening to the very fabric of reality? Recursion is the follow-up to the time twisting thriller Dark Matter.